Pyxis Media Group focuses on assisting Attorneys and Law Offices with increasing their presence online and via social media. Today we’d like to feature the Law Office of Daniel L. Hightower, Lawyer, P.A. 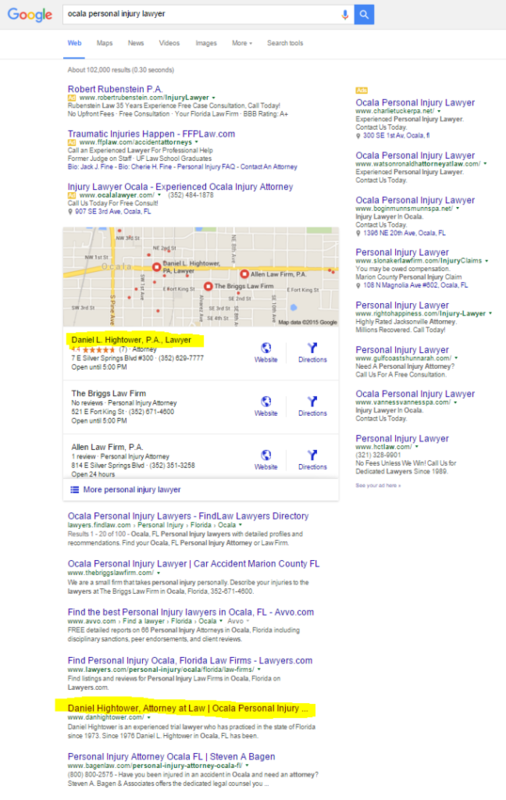 This first page placement would have cost upwards of $4000-$5000 per month utilizing Google paid search results, plus their website analytics show increased website traffic, user retention, and their social media presence and engagement has grown significantly. The Director of PR for the law firm mentioned that their calls from website and social media sources have also increased considerably. Pyxis Media Group only selects one attorney from a given geographic region to work with, so we ensure that focus is on results for that client alone in their market segment.